29/07/2011 - The Digos has made a series of raids in the night in Turin, Susa Valley and the Canavese. At the centre of the investigation some members of the anarchist, autonomous and also the No Tav movement. One of them was accompanied to police headquarters for legal clarifications. The operation, coordinated by the deputy director of Digos Tartone Cecilia, came two hours after the end of the clashes in the Chiomonette site between about two hundred hooded demonstrators and law enforcement. Of the seven raids that have already occurred, two were on the delegation of the judicial authorities for threatening behaviour, while five are the initiative of Digos looking for weapons and explosives in relation to the attacks made against the police in recent days. 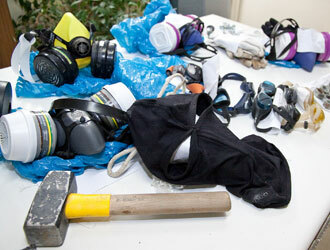 At the moment - the police announced - some slingshots, firecrackers and gas masks were discovered and seized. The same 'equipment' used last night, when the extremists launched lead balls, bolts and stone against police. The resultt is six wounded, one in serious condition with a leg injury: three policemen, two pcarabinieri and a finance guard. 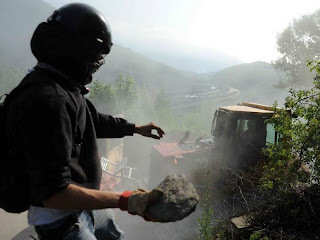 The attacks were unleashed from two sides: the archaeological area, which in recent days has already suffered serious damage, and the area under the motorway viaduct Clarea. Calm returned around 3.30, but the A32 was closed for 5 hours. The police report that "protractedvehement attacks." The protesters tried to attack a metal cable to the network in an attempt to eradicate it, but the rope was cut off by the police. During the night, protesters also set fire to the wooded area opposite the Archaeological Museum, which was promptly extinguished. For the duration of the unrest on the Avana road, in the area of ​​Chiomonte power plant, a hundred inhabitants of the Susa Valley against the railway infrastructure, carried out a vigil of protest. 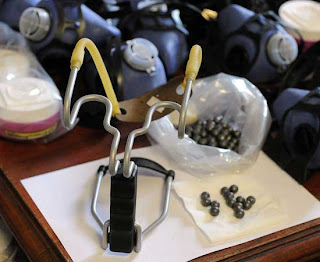 Last night a patrol of the Traffic Police, the ring road of the Val Susa near the exit of the A32 Turin-Bardonecchia, Turin arrested a 46 year old man, carrying 57 gas masks and 118 filters, a sporting sling and 96 balls of lead. The man who, according to police, belongs to the Committee for the popular struggle against the high-speed railway, has been charged with illegal possession of offensive objects. In the car in which he was traveling, the agents found a few boxes still packed with masks, worth about three thousand euros. According to the police station, in shops in Val Susa and around Turin, there has been an "extraordinary increase" in sales of construction material, such as helmets, padded gloves as well as gas masks in recent day.